SharedGeo is pleased to announce that after a six-year application process, our shared funding project GeoMOOSE has become officially sanctioned by the Open Source Geospatial Foundation, or OSGeo. GeoMOOSE went through the OSGeo Incubation process, which included a review of software licensing, the creation of a community-run Project Steering Committee, and the addition of promotional support from OSGeo. The project was facilitated with support from OSGeo volunteer, Jody Garnett, the GeoMOOSE project mentor. As officially sanctioned software, GeoMOOSE will be a featured project on the OSGeo website and joins MapServer as only the second program with Minnesota origins to be blessed by OSGeo. GeoMOOSE software is downloadable for free, and is useable under an OSI-certified open source license. Want to learn more? Visit the OSGeo or GeoMOOSE websites for additional information and to download GeoMOOSE 2.6.1! You can also learn more about GeoMOOSE and SharedGeo’s other projects in the SharedGeo Project Portfolio. SharedGeo Executive Director Steve Swazee and Technical Director Bob Basques presented at the Cook County Emergency Management Conference, which took place April 26-27, 2013. On Friday evening, April 26th, Basques and Swazee’s met with a community focus group to discuss the ongoing Minnesota Marker pilot project underway in adjoining Lake County. During this presentation, Basques and Swazee discussed SharedGeo’s efforts to develop standardize U.S. National Grid (USNG) emergency location markers that can be used throughout the United States. Swazee and Basques also received valuable feedback and ideas about how the signs could be used to help authorities respond to emergencies, continuing the collaborative spirit of the USNG project underway in Lake County. On Saturday morning, April 27th, Swazee and Basques provided two hours of USNG instruction covering the rational for U.S. National Grid use, basic concepts, GPS interface, map reading, and anticipated future developments. Among the attendees were several local trail managers who indicated they were excited about the potential use of USNG in their Search and Rescue efforts. For more information, see Bob Basques and Steve Swazee’s USNG presentation (see presentation called: “U.S. National Grid Trail Markers – Bringing Geolocation to a Trail Near You” and the SharedGeo’s USNG Marker project page. On April 10, SharedGeo Development Director, Sally Wakefield, and Technical Director, Bob Basques, spoke at the 2013 Nonprofit Technology & Communications Conference, an annual conference hosted by the Minnesota Council of Nonprofits. SharedGeo was one of more than 50 exhibitors in attendance who showcased technology-based products and services, along with educational seminars. Mr. Basques and Ms. Wakefield’s presentation discussed how nonprofit and government organizations can benefit from the use of Open-Source Geospatial mapping technology. Ms. Wakefield examined how free, open-source technologies can assist organizations with program and service development, member development and fundraising, and communications. Mr. Basques delved into the technical details of how SharedGeo and other nonprofit and government organizations use GIS. He also showed examples of how the recently OSGeo sanctioned software, GeoMOOSE, could be used in a range of projects. To learn more, see Bob Basques’s presentation and Sally Wakefield’s presentation. With a focus on getting and keeping Minnesota prepared for any type of emergency situation, the conference was the ideal place to formally present the SharedGeo developed USNG Minnesota Marker for the first time. In an emergency situation where road signs and other “normal” means to convey location are unavailable, the USNG information on the Minnesota Markers provides a standardized method for communicating location in a uniform and understandable manner between law enforcement, emergency responders, and others so that a response can be as fast as possible. Learn more at SharedGeo’s USNG Marker Project web page. Geospatial Information & Technology Association (GITA) to provide them with essential IT, data management and related support. This contract is a key part in supporting the new “ambitious plan for the future” as described by GITA President, Talbot Brooks. GITA’s plan for the future will focus on the professional educational needs of GITA’s individual and corporate members, including new educational content on the GITA website, webinars, opportunities to interact with GITA representation to bodies such as the GIS Certification Institute and National Geospatial Advisory Committee. In addition, GITA anticipates providing exciting new research and best practice projects and also professional networking and discovery opportunities. SharedGeo looks forward to supporting GITA in realizing its new plan to support geospatial technology and practitioners. 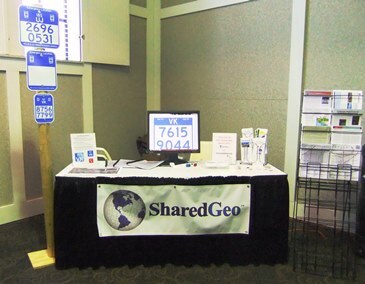 SharedGeo had a booth at the 31st Annual MN Government IT Symposium that was held on December 4-6, 2012. The symposium, which had over 1,000 attendees, is a key event where MN Government IT staff can network with colleagues and peers, attend workshops and sessions and visit with sponsors and exhibitors. SharedGeo was one of over 100 exhibitors and vendors that attended the symposium. SharedGeo’s Technical Director Bob Basques talked with many of the symposium attendees about SharedGeo’s technical expertise and experience. SharedGeo Technical Director, Bob Basques, explained to attendees that, “With minimal paperwork, Minnesota governments will now have access to some truly unique and inexpensive geospatial solutions created by programmers who have been on the cutting edge of technology for many years.” Learn more about contacting with SharedGeo. or view SharedGeo’s MCP-902TS Vendor Page. SharedGeo Executive Director Steve Swazee and Technical Director Bob Basques presented at the Minnesota GIS/LIS 2012 Conference on October 4, 2012. Basques and Swazee’s presentation discussed SharedGeo’s efforts to help standardize and increase the effectiveness of U.S. National Grid (USNG) Markers throughout the United States. After years of testing and multiple sign prototypes, SharedGeo’s efforts, along with the efforts of other local and national advisors, led to creation of unique emergency location sign based on the USNG. Known as “Minnesota Markers”, these signs use the USNG coordinate system to denote geographic location in a way that can be accurately and efficiently reported in an emergency, thereby increasing the success of emergency response efforts. 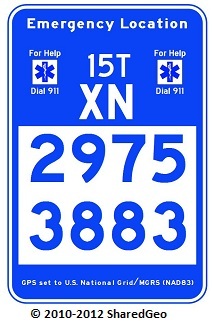 The signs are available as preprinted or blanks to allow local/field production, use a license-free font that mimics the Federal Highway Administration (FHWA) font, meet the FHWA color standard and the National Trail reflective standard, and use an eight-place USNG coordinate that is accurate to within 33′ when determining the location of an emergency. For more information see Bob Basques and Steve Swazee’s USNG presentation (see presentation called: “U.S. National Grid Trail Markers – Bringing Geolocation to a Trail Near You” and the USNG Marker project page. It covers a geographic area 750 miles wide, includes 8 states, a Canadian Province and has a freshwater shoreline of more than 10,000 miles. What is it? The Great Lakes basin. With this lead in, James Klassen and Alison Slaats presented an overview of the Great Lakes Restoration Initiative project at the Minnesota GIS/LIS 2012 Conference. GLRI, funded by the EPA and USFWS, is investing resources to clean up toxic substances, combat invasive species and restore wetland and shore habitats in the Great Lakes basin. SharedGeo is contributing to these goals by creating a data catalog and mapping tool, CoMap. Together these tools pull together data from many agencies and organizations across this large geography. The presentation explained that in addition to the catalog and CoMap, James Klassen has optimized delivery of over 40 TB of imagery and remote sensing data in ready-to-use services. In addition, it was described how this project was accomplished using open source software, such as GeoMoose, Mapserver and OpenStack Object Storage (Swift). The presentation was well received and generated some good conversations during and after the conference. To learn more, see the GLRI presentation slides or check out the GLRI project page. 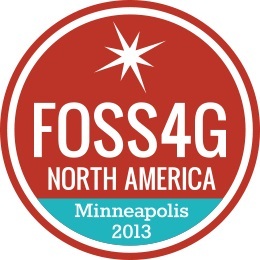 Details of the event are expected to be released in early December on the FOSS4G North America website. SharedGeo is pleased to announce that effective August 2, 2012, SharedGeo has assumed full responsibility for the EPC Updates blog, formerly maintained by the Emergency Preparedness Committee of the Minnesota Geospatial Information Office (MnGeo). This arrangement was reached after MnGeo determined restructuring of various services at the office meant it would be preferable to have the blog hosted elsewhere. SharedGeo will donate the time of Executive Director Steve Swazee to maintain EPC Updates, a blog which provides weekday review of cross-cutting geospatial and related technology news focusing on the Emergency Services Sector.